Blood flows from your heart to the rest of your body through arteries. It is then carried back to the heart through your veins. Blood is meant to only pump in one direction and so veins have small valves in them that make sure this happens. Where these veins develop weaknesses in the walls, blood pools and causes the veins to distend and some blood flows in the wrong direction. 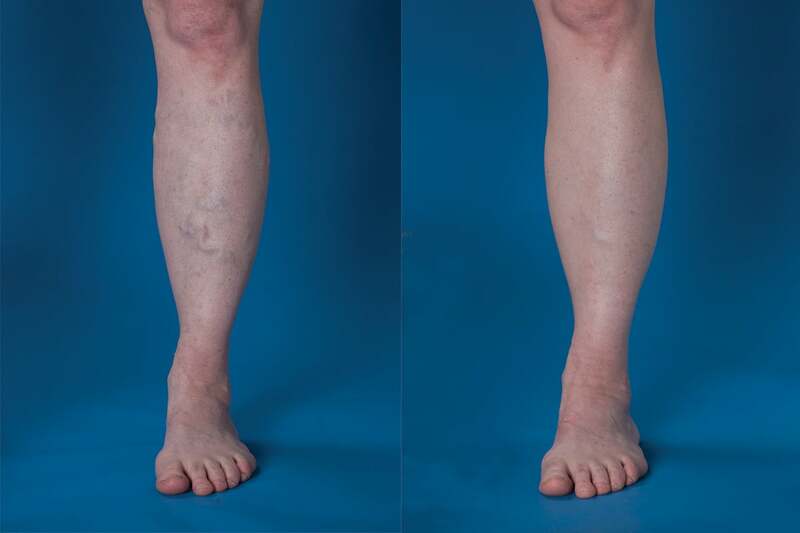 These distended veins, if they're near the surface of the skin (called 'superficial' veins as opposed to 'deep' veins) take on a bulging appearance and protrude a little from the surface of the skin - these are varicose veins. The veins most likely to become varicose are the main superficial veins in the leg called the 'saphenous' veins, the largest of which is called the 'Great Saphenous Vein', which runs from the ankle to the groin on the inside of the leg. Varicose veins are in fact only one type of abnormal vein - the other two types are 'spider veins', the finer red veins on the surface of the skin, and 'reticular' veins, which are blue and slightly further beneath the skin. When these veins become abnormal they stop working properly and the medical term 'incompetent' describes this state. 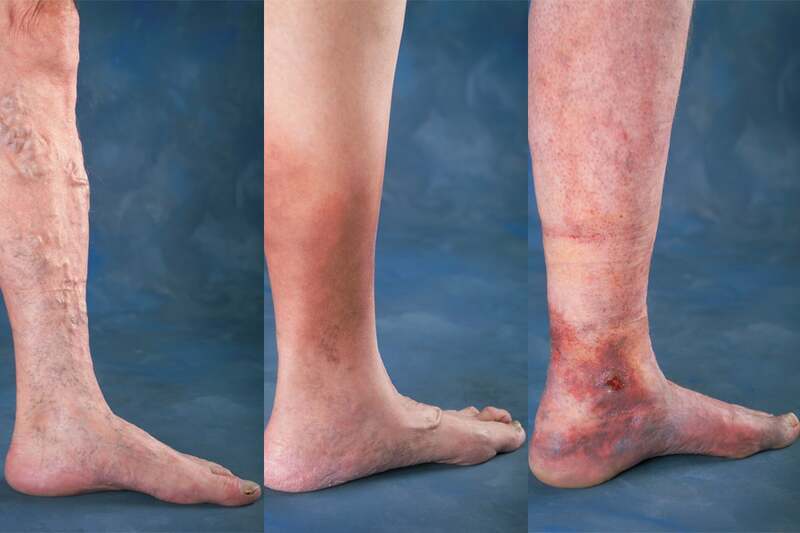 As well as the visible protrusion of varicose veins, other symptoms may include leg swelling, pain, fatigue as well as cramping in the leg/s and a burning sensation. In severe cases rashes, skin discolouration and ulcers may develop. Varicose veins are often hereditary, but are also common for women during pregnancy and they can also be caused by injury to the leg, spending a lot of time standing up, being overweight or not very mobile, or simply as part of the ageing process. Up to a third of the population is affected by varicose veins, with women slightly more prone to develop them and at a younger age. Although varicose veins are visible on the skin, ultrasound is usually used to diagnose the extent of the vein structure affected. Once there are changes affecting the skin it is generally recommended that varicose veins are treated, as any poor flow of blood in the veins may lead to future complications such as ulcers, inflammation (phlebitis) and formation of blood clots. Varicose veins that are not causing you any problems and are not affecting the integrity of skin on the leg do not need to be treated. However, even if you do not have severe symptoms of venous insufficiency you may have unsightly visible veins that you want removed. This is very common. These open techniques have been around for a long time, and they are safe and effective. Dr Hagley however prefers to use minimally invasive techniques in most cases. They also have excellent results and allow faster recovery and return to work. This technique is generally used on the larger saphenous veins and uses keyhole techniques with laser and ultrasound technology to collapse the affected vein/s. A <1cm incision is made around the inner knee area and the catheter is passed through the diseased vein under ultrasound guidance. Endovenous radiofrequency ablation pre and post operative photos. Photo is indicative only and actual results may vary. © 2017 Medtronic Inc. used with permission. This is a procedure where a 'sclerosing agent' is injected into the affected vein which makes the vein close up. Sclerotherapy techniques such as Ultrasound Guided Sclerotherapy (UGS), Microsclerotherapy and Catheter Guided Sclerotherapy (CGS) deliver the sclerosing agent in different ways. When veins are treated, they are no longer able to carry blood, however the treated veins are not working in the first place, and they generally make up less than 1% of the vein structure in each leg. After treatment, blood makes its way back to the heart through the remaining vein structures. Overall blood circulation is improved when 'incompetent' veins are removed or sealed.